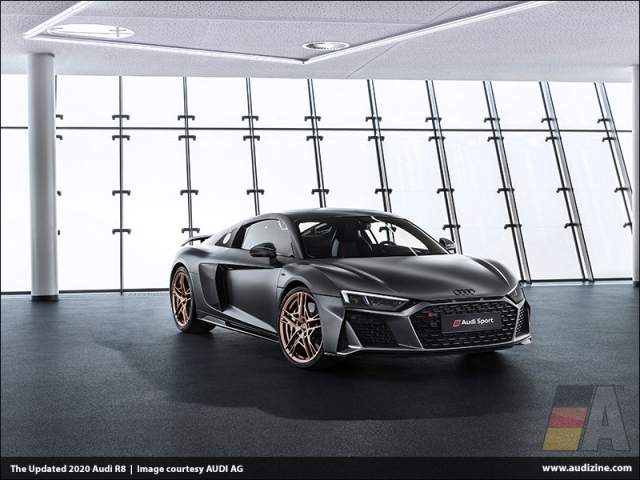 Limited edition Audi R8 V10 Decennium celebrates ten years with unique design cues; 222 units available globally with 50 in the U.S.
HERNDON, Va., April 11 2019 - The iconic Audi R8 will make its appearance at the 2019 New York International Auto show in a big way, with the U.S. debut of both the updated 2020 Audi R8, and the limited edition R8 V10 Decennium, built in celebration of the model’s ten years of powerful V10 engine performance. Each generation of the R8 brings to the road know-how acquired on the racetrack and from the legacy of Audi endurance racing. This year is no different. Updates to the 2020 R8 model line deliver a refreshed exterior design. The updated front bumper includes a new honeycomb grille with R8 badge, front spoiler lip, and lateral air intakes. The updated rear bumper continues with honeycomb air outlets, oval exhaust pipes, and a new rear diffuser. The headlights have also been darkened, and the rocker panel has been redesigned and includes an inlay. On the V10 model, the lower trim is finished in high-gloss black, and on the V10 performance model, the lower trim is finished in titanium color, with an option to select carbon fiber. Ascari Blue metallic is a newly added color option for the V10 performance models, while all R8 models receive Kemora Gray metallic as an all-new color option. 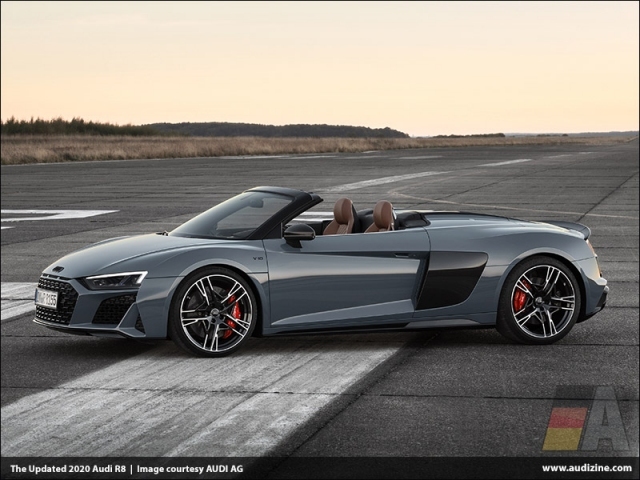 The V10 performance model also has available black Audi rings and badges, and the V10 performance Spyder (previously known as the R8 V10 plus Spyder) receives a standard gloss black windshield frame to identify it as the performance variant. The V10 models also receive 19-inch 5-double-spoke design forged wheels in an anthracite bi-color finish, with optional 20-inch 10-spoke-Y design forged wheels in high-gloss anthracite as an option. The V10 performance models now come standard with 20-inch 5-double-spoke-dynamic design milled and forged wheels in titanium finish, with an option to change the color to anthracite finish. The ceramic brakes on the V10 performance models are now also available in red along with the standard gray. Sporty race features continue inside, where the driver-oriented interior features standard Audi virtual cockpit with Sport mode, MMI navigation plus, LED interior lighting and Bang & Olufsen® Sound System with 13 speakers (standard on the V10 and optional on the V10 performance models). Two new available interior colors are available: Pastel Silver and Palomino Brown, and the Audi phone box with signal booster and wireless charger is included in every R8 model. 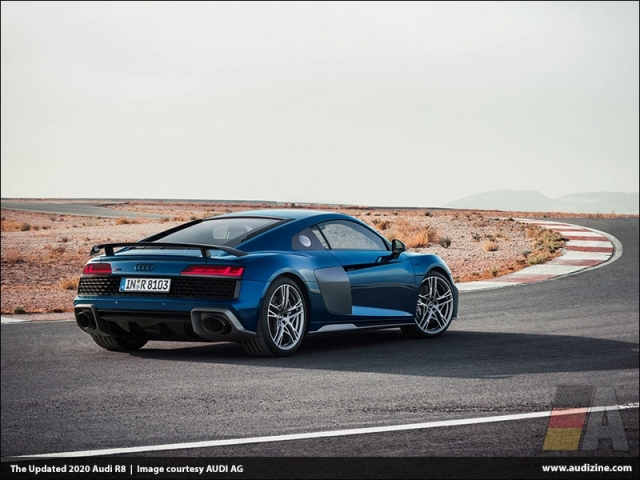 Featuring the same naturally aspirated V10 engine found in the R8 LMS racecar, quattro® all-wheel drive, and a functional yet technologically advanced cabin, the R8 is the pinnacle of performance for Audi, with no other model bearing a closer tie to racing. New for the R8 performance Spyder is an available carbon fiber front sway bar, which saves 2 kg (4.4 lb) of weight. 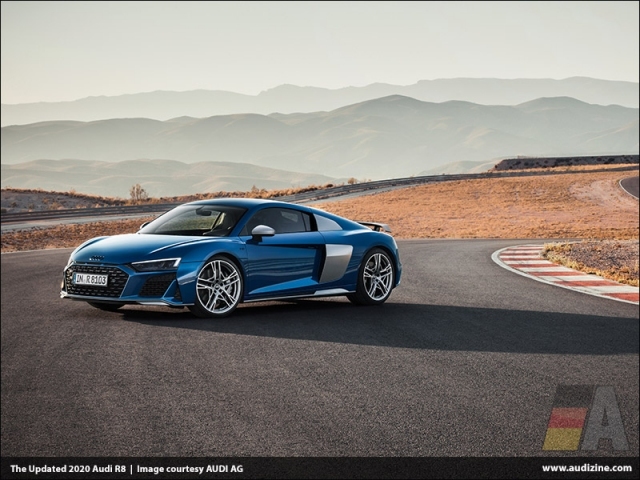 Featuring a seven-speed S tronic® dual-clutch transmission, which can shift gears in as little as 120 ms, the R8 V10 Coupe achieves 562 horsepower - 30 more horsepower than the previous model - and reaches 60 mph in 3.4 seconds and top track speed of 201 mph. The R8 V10 performance coupe (previously known as the R8 V10 plus) maintains 602 horsepower and catapults from 0- 60 mph in 3.2 seconds. Reaching 602 horsepower and sprinting from 0-60 in 3.2 seconds, the limited edition Audi R8 V10 Decennium is a celebration of the V10 engine and its storied heritage with the Audi brand. The last 50 units of the special edition, numbers 173 to 222, will be available in the U.S. from of a limited global production of 222. With special edition paint options, and unique Decennium logo placement inside and out, the R8 V10 Decennium makes its special edition character clear. The model is offered only in coupe form, and in the U.S., all 50 units are painted in Mythos Black metallic. The milled 20-inch wheels and the intake manifolds of the 5.2 FSI engine are finished in matte bronze. The front spoiler, the side sills and the diffuser are painted in gloss black, supplemented by black Audi rings and badges on the exterior. The side blades, rear wings, and the exterior mirror housings are made from gloss carbon fiber. The interior of the R8 V10 Decennium is also finished entirely in black, with the inlays in gloss carbon fiber adding highlights. The diamond stitching on the sport seats is finished in gloss black with contrasting stitching in a copper tone. The selector lever and the steering wheel - with Alcantara rim and black 12 o’clock marking - feature copper-colored stitching, along with the center armrest, the door armrest and the door rail. A "Decennium" logo adorns the center console, the door panels above the armrest, and the inlays in the gloss carbon fiber door sill trims, as well as the logo projector when the door is opened. The badge in the center console stands out visually from the gloss carbon fiber around it. It comes with a partially matte finish - a process patented by Audi - with the surface of the material roughed down a few thousandths of a millimeter using a special powder. The door light projects the "Decennium" logo onto the ground, supplemented by the model’s sequential limited-edition number. The naturally aspirated 5.2 FSI engine in its most powerful output rating forms the heart of the R8 V10 Decennium. With 602 horsepower and maximum torque of 413 lb-ft, it catapults the special edition model from 0-60 in 3.2 seconds with a top track speed of 205 mph.